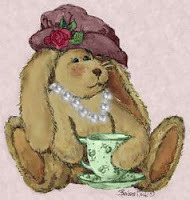 I didn't post this little Birthday Bunny with the recent Inky Friends blog hop because my customers and downline made this card last weekend for my Hostess Appreciation Brunch, New Catalog Open House and Downline Meeting. I wanted it to be a bit of a surprise. 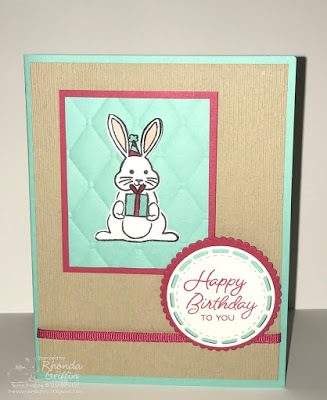 This card was quick to create because I positioned the stamps on the block using a punched shaped of the Bunny Punch. That made it so it would be stamped once and punched once. 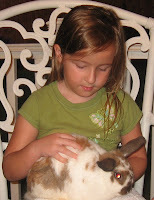 You just have to flip it--you'll see what I mean when you try it. Simple and quick! We did have to fussy cut the tiny hat and present, so I let everyone decide for themselves if they wanted to add those elements. I hope you can use this tip in your stamping! The new Stitched Labels Framelits are so useful! I really like the added detail on the circle I used for the sentiment. The Subtle Dynamic Textured Impressions Embossing Folder added just a bit of texture to the Crumb Cake layer, and the Tufted Dynamic Textured Impressions Embossing Folder added a cute design behind the punched bunny.